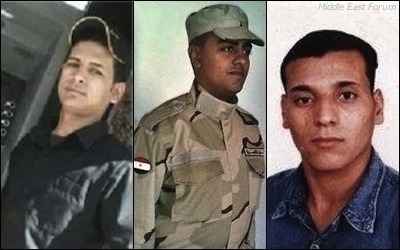 Egypt: Another Christian Killed in His Military Unit, Supposedly by "Suicide"
Coptic Christian soldiers in Egypt killed by Muslim comrades in recent years include, from left to right, Baha Saeed Karam (August 2015), Bahaa Gamal Mikhail Silvanus (June 2015), and Hany Seroufim (August 2006). Another young Coptic Christian conscript has allegedly committed suicide in his unit in Menufia, Egypt, says a February 17 report by MCM (actual date of incident not indicated). According to Maj. Gen. Muhammad Mas'ud, the 20-year-old Copt known only as Michael "shot a bullet from his firearm into his chest, dying instantly." He supposedly killed himself "after receiving a phone call from his home," added Mas'ud. Read here for several more accounts of this "phenomenon" of Coptic Christians being killed in their military units under "mysterious circumstances," including supposed suicide. Accordingly, lawyer Hani Ramses remarked that "It's new for us constantly to hear about Coptic recruits killing themselves in the military and police stations. It's especially strange that it's happening now, and not previously, when Egypt was often in a state of war and under constant threat... The killing of Coptic conscripts in the military has become a [new] phenomenon." The lawyer also wondered if these deaths indicate that "extremist groups" have infiltrated the Egyptian military.